The Fourth » And I really thought we could trust that guy! And I really thought we could trust that guy! Tuesday is our 2nd birthday. I hope you will join us for… something special! I’m not even sure what yet! Yes, Derk has handcuffs in front of his armbands. And Cyril didn’t look too happy about being put up for collateral. I wonder how he prefers being arrested. To be fair, Skärva would NEVER bet Cyril if he thought he had a chance of losing. …He needs someone to operate that compass! Poor Cyril. 8D But his misery makes me smile. AHHHH BIRTHDAY. Must fanart if I can function!! Oh, OHGOD the scratch tickets. Look at the name of one of my pets, haha. You can see that I’ve always loved that name. “His misery makes me smile.” People like it when Skärva is upset too. We are all just horrible people! Ahhh, her name is Lorelei!~ That’s precious! And I didn’t know “dragons” was a hobby. AND THOSE SCRATCH TICKETS WERE RIGGED FALX I’M TELLIN YA. Lorylei, technically I’m sure Lorelei was taken. NEOPETS IS HELLA MESSED UP. I can’t believe this stuff didn’t bother me when I was 13 XD Y’know, come to think of it, it did a bit, but I was too bored/lonely to find something else to do, haha. Pff, whatever cops. Skärva’s a final boss-tier villain. Your laws mean nothing to him! …Probably! Nope. This is the second-to-last strip. The final strip is just a picture of him, looking forlorn, in a jail cell. THE END. Yep, we wanted to wrap it up just in time for our second birthday. Two years is a long time to work on this stuff. The laws don’t mean anything to him, but the handcuffs certainly do. Another altercation with the police, let’s see how this one turns out. Uh-oh, Z, looks like we’ve got the police on the field again. With no pirates to distract them, how are Skaerva’s Schemers going to get out of this one? Oh my, the Skärva Schemers is a perfect name for a sports team. I’m imagining some of the minions of various temples (including Castle Skärva) forming a league of… whatever sport is big in Idenau, and playing amongst each other to blow off some steam. I’m imagining it plays a little like BloodBowl. Welcome back folks! If you’re just tuning in now, Skärva’s Schemers are playing a shell game with the Godly Goodies, who’ve brought in Blank as a ringer. Unfortunately for the Schemers, the Port Town Police have caught them with a little gambling of their own, and it looks like team captain Tiberius Skärva himself (number 4, in the green and blue jersey) might be out of play for a bit. All of this Cyril abuse makes me think he’s going to do some big heroic (er…villainous in this case, I guess) act by the time everything is said and done. He’s too much of a punching bag to just throw away. You seem kinda shocked there, Skarva. 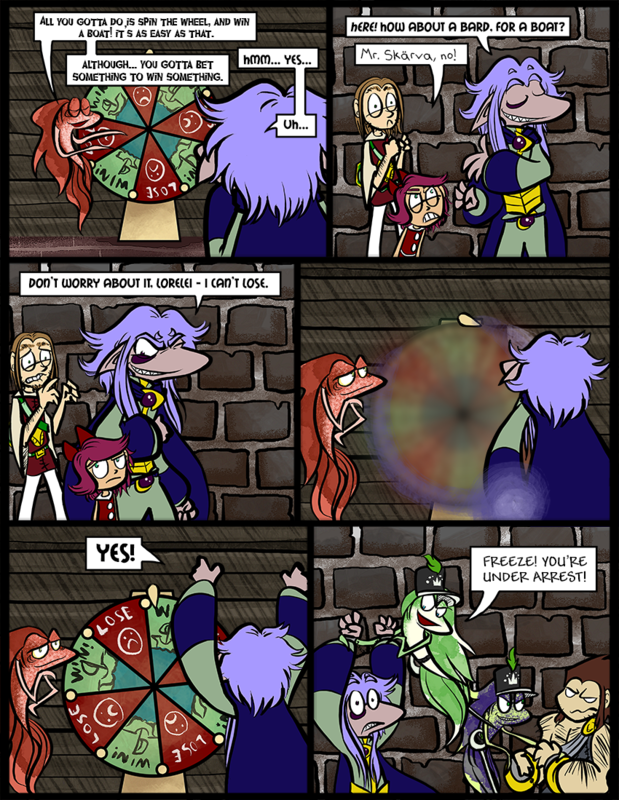 Maybe magic is somehow ineffective against the law. That’d be interesting. Birthday! Well….you already got mediocre fanart from me. Consider that an early birthday present. Oh, please, I loved it! Thanks again! I also remembered that I’m going to be at the hospital Tuesday. ;A; I hope you guys have fun whatever you end up doing while they catscan the heck outta me. I JUST REALIZED HOW AWFUL THAT SOUNDED. I’m not sick or anything, don’t worry! And I honestly do hope you guys have fun. Yeah, I was worried for a second! I’m sure there won’t be any event that you’ll miss, exactly. XD Probably just some new content. What! Goes the Skærva, This is entrapment! Then he remembers that he’s the most wanted man in Idenau anyway. This is just one more thing to go on the rap sheet when he busts up this sting. The only reason they’re actually arresting him is because he was cheating at the illegal gambling. Using Dark Magic to rig what’s already a 50/50 game? For shame. Wait, if the gambling was illegal, and he was cheating at it, does it cancel out? Does it make what he was doing perfectly ok? Second time someone tried to arrest him, well the first time they got distracted by pirates but still. With all these police around I wonder how they’ll get a boat. Also even besides the fact they’re not kidnapping the princess and how that seems to not be in line with his normal plans I’m guessing at least two sitings of Skarva by royal police around the sea side would certainly make veronica aware that he’s up to something different. Maybe Veronica will just think Skärva is taking a well-earned vacation! And it’s not (just) the smell! After all this time of Cyril’s face being a circle, his head now looks deflated. I’m liking that (ridge?) that Derk has, though. I swear, did not make that typing failure.^^^ It’s captcha’s fault. Yeah, the idea of “head – or lack thereof” is kiiinda freaking me out. I promise, I was just trying to subtly say that Cyril’s head is empty, not gone entirely. I won’t be that mean. Why is the only thing I can think of “Wheel! Of! Fish!”? That, and will the police be so cruel as to arrest a cute and harmless little girl? I mean, technically, what has she ever done wrong? Please note that Lorelei and Cyril aren’t actually in handcuffs yet. Time for a daring rescue. Ah yes, but of course. Lorelei will save the day. Skarva is the dark lord!!! YOU BEST RUN PEONS OF THE LAW! YOUR TRICKERY WILL DO YOU NO GOOD HERE! ALL SHALL SOON VANISH IN THE COMING BLAZE!! gg skarva gg… idk how you manage to do this every time….. how? Well he’s never been captured before, actually, has he?